Now we’ll broaden the discussion to consider a related indicator, one that we like because it looks directly at the bank credit cycle. Our bank credit indicator is worth watching, for two reasons. First, the latest readings are more interesting than the latest yield curve readings, as you’ll see in Part 2. Second, bank credit is arguably more fundamental to the business cycle than any other measurable piece of the economy. If you’ve followed our recent work, neither of our two claims should surprise you. This isn’t the first time we’ve written about bank credit—we’ve occasionally tried to popularize a way of thinking about banks that’s distinctly unpopular, albeit consistent with certain heterodox schools of macro. In fact, this article is a companion piece to “An Inflation Indicator to Watch,” a follow-up to “Learning from the 1980s,” and we’re also drawing from our book Economic for Independent Thinkers. We’ll recap a few points from that earlier work here, but to make our repetition seem a little less repetitive, this time we’ll explain the points differently. Namely, we’ll ask you to picture yourself as part of the story. Imagine you’re an experienced banker who understands both the legalities of bank charters and the mechanics of loans, and you’ve been asked to prepare for a new assignment by refreshing your understanding of two big, broad and overlapping topics—the economy and the business cycle. You’ve cleared your schedule and holed up in a quiet room with only a stack of relevant books and papers, a thick pad of paper and your deep thoughts. I’ll call you IT, short for Independent Thinker. You remind BBM that bank loans create money—in the form of deposits or cashier’s checks—from virtually nothing, and that the new bank-created money flows directly into nominal GDP as borrowers spend it. It might boost GDP’s real growth component or its inflation component or both real growth and inflation, but regardless of which component is most affected, bank lending is fundamentally different to the lending that takes place outside the banking system. 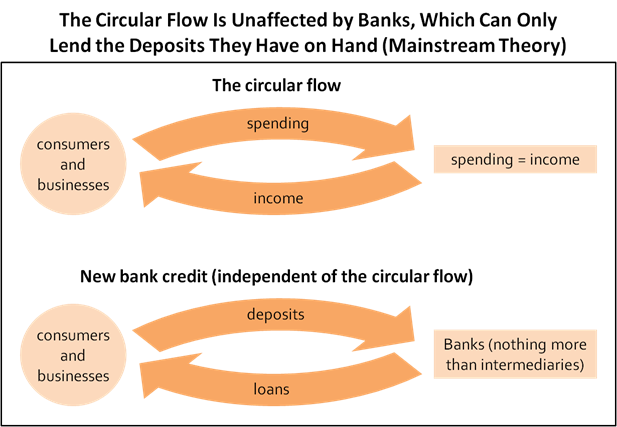 Loans that aren’t extended by banks require the lender to accept a reduction in purchasing power in favor of the borrower, whereas bank loans require no such trade-off. 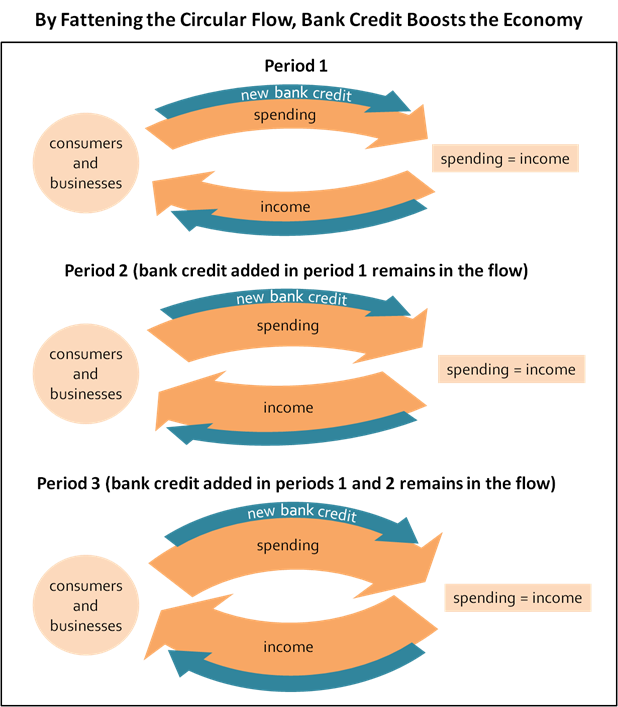 You then explain that your diagram also operates in reverse—the circular flow contracts when old loans are redeemed, sold or written off at a faster pace than new loans are extended, or in other words, when bank balance sheets shrink. Stating the obvious, you conclude that banks have quite a lot to do with the business cycle. As you and BBM compare the diagrams, in walks one of your asset management division’s sharpest portfolio managers, one who never whiffs on an opportunity to trash economic theory. I’ll call him DT for Doubting Thomas. We’ll pick up the conversation as DT explains that he couldn’t reach BBM by phone. DT: “Sure they do, but they’re claiming to have extinguished a blazing house fire with squirt guns and water balloons. The problems are too widespread and deep-rooted. Fixing them means just about starting over—it means going back to where macro was before Keynesianism and then working forward from those economists who objected to Keynesian modeling, such as Joseph Schumpeter. And when you do that, you’re not in the mainstream anymore. DT stops as the door opens again and our fifth character walks in. We’ll call him UM for Useful Monetarist, “useful” because this character, as if in some corny comedy, can’t tell a lie. After some small talk, UM learns that BBM, IT and DT were discussing connections between banks and the economy. Curious, he decides to stick around. BBM then resumes his questioning. BBM jumps up and blocks the path to the door. He politely asks UM for another five minutes—to give the devil’s advocate view, or at least to offer some reaction to DT’s and IT’s comments. UM looks unhappy but sits down and agrees to share his thoughts. UM: “Well, my company insists all products have to be constructed from four materials—M, V, P and Q. And our only supplier for M, by the way, is the central bank, with commercial banks being relatively insignificant as at the other major firms. Those are the two most important of our core tenets. BBM: So you’re ignoring reality. Although we’ve left little doubt about where we stand in relation to the five characters above, we imagine readers having a variety of reactions. In your own case (not the character we conjured but the real you), maybe we’re singing to the choir, maybe you’re a mainstream economist and would like us to stop writing these articles, or maybe you’re on fence. Wherever you stand, we encourage you to consider the evidence that supports our way of thinking, which you can find in a few places. In “Learning from the 1980s,” we shared statistics showing that the money measures used in A Monetary History have retained their correlations to GDP, whereas other measures such as M2 have not. In “An Inflation Indicator to Watch,” we used the circular-flow approach to develop an inflation indicator with an excellent historical record. And in the second part of this article, we’ll provide possibly the most useful evidence—we’ll add to the analysis included in our book that supports a shin bone to the thigh bone–close connection between bank credit and the business cycle. If you’re willing to entertain that bank credit might be more revealing than mainstream commentators give it credit for—macro theory getting it badly wrong and all—you might like to pay attention to the indicator we’ll discuss in Part 2.